Unlike other capital cities in West Africa, Nouakchott did not serve as capital of Mauritania for most of the colonial time, inheriting this function from Saint Louis only in 1958, shortly before independence in 1960. Until that time, Nouakchott was a small fishing town of only 200 inhabitants. In the following decades, Mauritania underwent very rapid urbanization from 858,000 to 3,873,000 inhabitants between 1960 and 2013. The urban growth occurred primarily in the coastal cities of Nouakchott and Nouadhibou. A study of settlement patterns in Nouakchott showed that much of the city’s rapid growth has been in informal settlements with limited access to urban services (Urban Habitat, 2016). The rapid growth of the city was driven by a long series of drought years since the beginning of the 1970s, and by the degradation of the land and vegetation resources that ensued. As wells dried up and forage and firewood became harder to find, many rural Mauritanians migrated to Nouakchott in search of work and a better life. Those environmental refugees added to the refugees displaced by the Western Sahara war in the 1970s, who had swelled the population of the city. 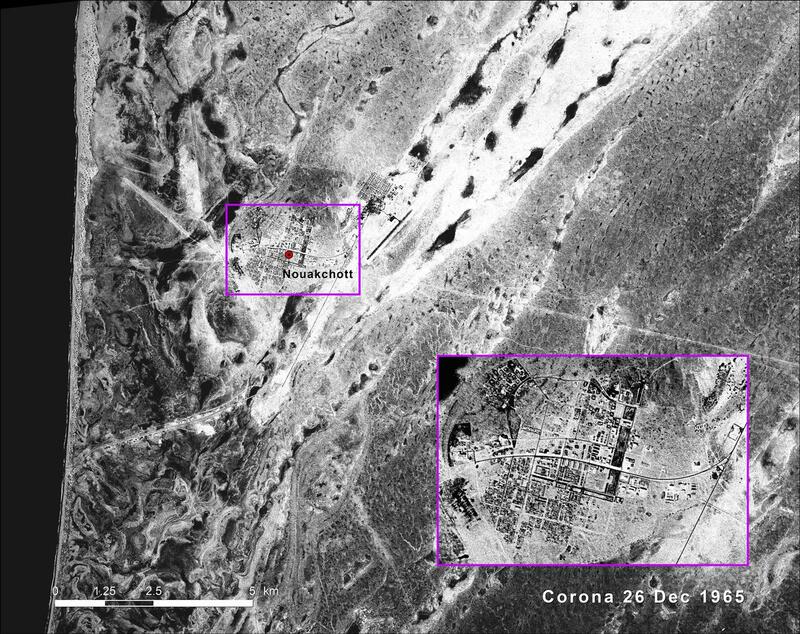 A comparison of a Corona satellite image from 1965 and a high-resolution image from 2016 illustrates the dramatic expansion of the city, whose urbanized area sprawled from only 5 sq km in 1965 to 150 sq km in 2016. Low density development, including considerable undeveloped open space, predominates in the urbanized area, due to a cultural preference for detached single-family houses on large tracts of land. 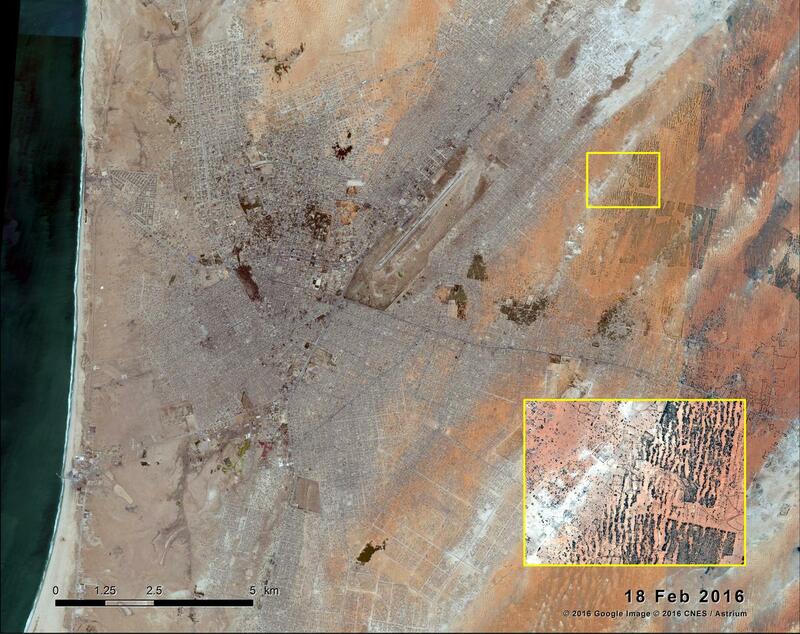 Sand dunes advancing from the east are threatening buildings and infrastructure, particularly in the rapidly growing peri-urban areas. In a major dust storm, dunes may move several meters. In order to protect the city from the encroaching sands, the Nouakchott Green Belt was first established in 1975; however, it had to be extended in the 2000s as the city had grown beyond its boundaries. Up until today, a total of 12.7 sq km have been stabilized by afforestation with Prosopis julifora, Euphorbia balsamifera, Leptadenia pyrotechnica, Acacia senegal and Balanites aegyptiaca as well as sowed with grasses such as Aristida pungens and Panicum turgidum (see above inset and adjacent picture). In addition to curbing sand encroachment, the green belt has provided employment opportunities and fostered agrosilvo- pastoral development (Berte, Ould Mohamed, and Ould Salek, 2010).